The broad U-shaped valleys and steep face of the Cascades’ eastern flank reveal the power of ice age forces. This highland ecoregion averages between 3,000 and 7,000 feet in elevation. Extremes vary from more than 12,000 feet at Mount Adams, an active stratovolcano, to a mere 100 feet above sea level along the Columbia River Gorge. 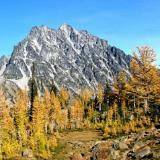 In the East Cascades ecoregion, the country’s largest granite batholith is found in the Stuart Range. Serpentine soils have evolved from the distinctive geology of the adjoining Wenatchee Mountains. These soils are high in magnesium and low in fertility. They provide habitat for a suite of specially adapted plant species. Canyons etch the flanks of the East Cascades. These include Tumwater Canyon, which parallels Highway 2, and Hell-Roaring Canyon, which drains the eastern slopes of Mount Adams. These watersheds flow into the great Columbia River. Near Chelan, the Columbia forms the northeastern edge of ecoregion before the river turns eastward into the Columbia Plateau. The Columbia returns to border Klickitat County along the ecoregion’s southern edge in Washington.